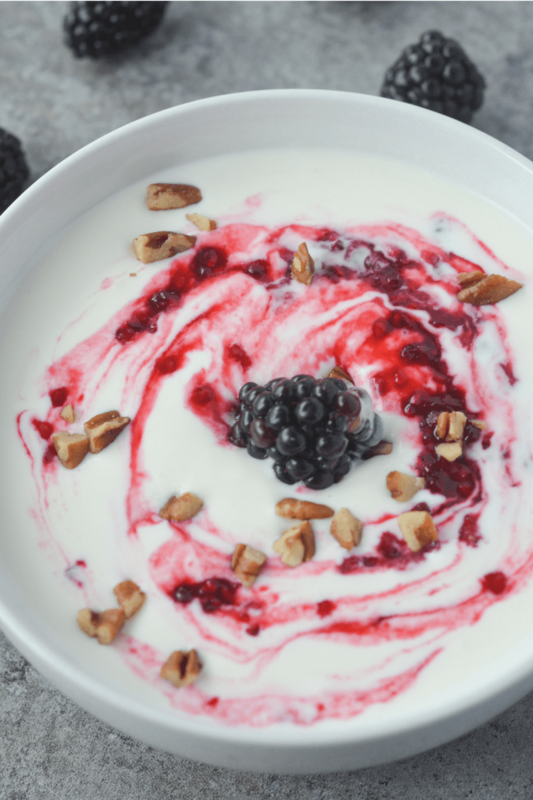 This low carb yogurt is super easy to make and actually good for you! With just 2 net carbs (for the base), it’s the perfect way to brighten up your morning! I’ve always been in love with yogurt. Ever since I can remember it’s been one of my favorite breakfast foods/snacks/bases for smoothies. Unfortunately, most yogurts you’ll find at the grocery store run waaay too high in carbs. The popular brands are pretty much the same thing as eating a pile of chilled sugar. I realized when I started cutting the carbs, I even wanted to avoid the lighter/low carb varieties. They were just disguising the bad stuff and calling it healthy. I was playing around in the kitchen the other night, and I finally came up with a yummy recipe to calm my yogurt cravings. It’s suuuper easy to make, delicious, and it’s actually good for you. You just need sour cream (I know, seems a little weird, but trust me, it works), heavy whipping cream, and a sweetener like Swerve (erythritol). I used powdered Swerve so it would be smooth. Use whatever sweetener you’re used to, just add a little at a time until you get the desired taste. Note: this yogurt BASE is 1 carb per serving. Once you add things like blackberries, walnuts, or any other toppings you desire, the carb count will definitely go up, so be careful and watch what you’re putting in closely. It’s not a complete yogurt replacement, but it definitely satisfies my cravings. I also added a few walnuts for a nice crunch, blackberries, and a squeeze of lemon for flavoring. Blackberries are one of the lowest carb fruits, but still remember to use them sparingly. You can also flavor your yogurt with vanilla extract or a sugar free vanilla syrup, like Torani. Just a little bit can make a big difference in flavor! Check out my recipe and let me know what you think! I LOVE this! I miss yogurt so much on a keto diet. At first I was nervous about the sour cream, but after you flavor it….it is delicious. Thank you for sharing the recipe. This is the best yogurt since I have been on Keto !! This is wonderful!!! Satisfied my yogurt craving. Thank you! Hi! Am I using a hand mixer to mix or just mixing with a spoon by hand?? Ty much!! This was insanely delicious and so easy to make! Just made your yogurt today. It has the same texture as as a real yogurt. This is delicious, but I am very confused by the macros. What sour cream are you using? I use full-fat (14%) sour cream, and it also has 2 carbs, but that’s per 2 tablespoon serving! That means 1/2 cup would be 8 carbs, and 180 calories just for the sour cream alone. I can’t imagine what kind of sour cream you have that would be only 1/4 of those numbers…can you please share? Thanks! I used Daisy brand which is 1 carb per 2 tablespoons and 60 calories a serving. This recipe makes 2 servings of the yogurt. Since half this recipe is technically using 4 tablespoons of sour cream, that’s only 2 carbs for a serving or 4 carbs ffor the entire batch. I do notice many store brands tend to have 2 carbs per servings, which could make the difference here. Hope that helps! There are 8 tablespoons in a 1/2 cup, not 4. Your recipe calls for a 1/2 cup of sour cream. So this would mean it comes to 4 carbs for a 1/2 cup. Also when I put in that I’m using 1 tsp. of monk fruit sweetner that’s another 4 carbs. Can you explain your math on this? Yes, there are 4g carbs in 1/2 cup of the sour cream I used. This recipe serves 2. So there’s 2g of carbs in half this recipe. As for the sweetener, sugar alcohols and fiber can be subtracted from carb totals. So you would subtract your sweetener, unless you’re specifically counting total carbs. 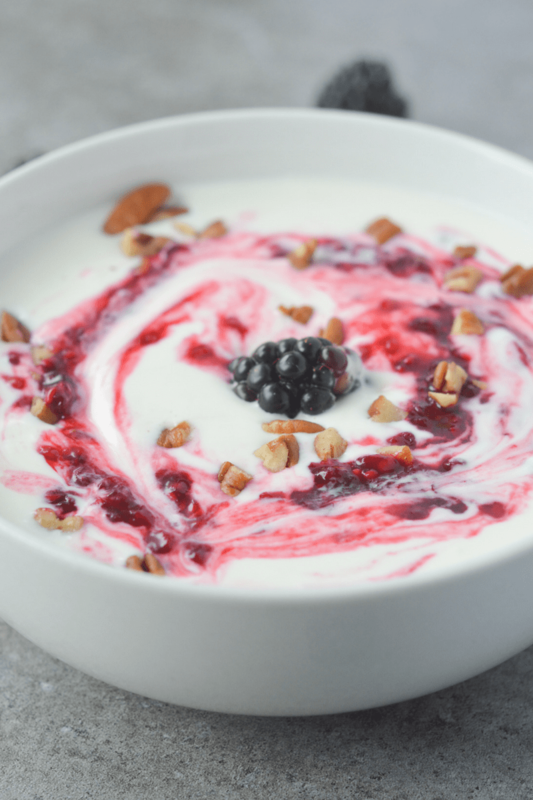 I’ve been googling how to make heavy cream keto yogurt in my instant pot and came across your post…..so much easier and so tasty and it really does satisfy my yogurt cravings. I used sugar free vanilla Torani syrup to sweeten it, a touch more heavy cream and then put a few tablespoons of warmed blueberries in and it was FANTASTIC. Great idea. Thank you! I was wondering if you had ever tried freezing this ? Frozen yogurt sounds great! That’s a great idea, I’ll have to try it! How is sour cream different than woke fat yogurt? Sour cream is fermented cream. Cream is naturally lower in carbs and higher in fat because of the process used to obtain it. Whole milk and whole milk yogurt often have much more sugar than sour cream. For example Stoneyfield Organic Plain whole milk yogurt has 12g of carbohydrates per serving because cow milk naturally has sugars. I made this tonight with liquid chocolate stevia flavoring and it was delicious!! 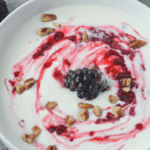 Thanks for the great recipe…just starting my Keto journey to better health and I am glad I don’t have to give up my yogurt!! I was already using this and thought I was just being weird. It’s great.! This was DELICIOUS!!! SO glad I tried it…was skeptical but it was fantastic! I make this yogurt all the time, but is there anyway to use a yogurt starter with this in order to add the probiotics? Maybe a vegan yogurt starter? Has anyone tried this? Also works with light sour cream and half and half. I mixed in some cocoa powder for texture and some Collagen Peptides for extra protein and structure. Does using light sour cream and half & half change the carbs? I absolutely HATE yoghurt but this fake yogurt is lovely ….I’m rather impressed !! OMG this is delicious! My mom used to make us sour cream and sugar sandwiches sometimes when we were little (yes, i know it sounds weird). And this yogurt is literally the exact same thing! But one quick question – how long will this last in the fridge? I was thinking of prepping all my yogurts for the week but didn’t want to get to Wednesday and be sadly disappointed! This looks awesome and I’m going to try it. I’ve been doing “keto” since before it was called that. I fell off the wagon several years ago but have recently come back to the fold as it’s the only way of eating that works for me. Anyway I wanted to mention that when my kids were growing up I made yogurt often. And then when I started low carbing I decided to try making it with heavy cream and it worked! And it’s amazing. Obviously more work than this but try it! I’ve been searching for a way to satisfy my love of yogurt but stay true to my Keto woe and you did it for me!!! Thank you so much! The possibilities are endless with this! It’s so delicious and creamy and lovely and wonderful! Thank you!! 1/2 teaspoon of vanilla and 1/2 teaspoon of chocolate was what I used to flavor mine and OMGOODNESS! THAt sounds yummy but own much did that increase the carb content????? Just curious. Need to be whipped before added to the sour cream? This has become a favourite of mine. Make it in the morning with some flaxseed and blueberries in and eat it when I need something sweet at work. So I’m not really understanding the benefits of this unless I’m missing something. The reason I eat yogurt is to get the benefits of the probiotics. Are there probiotics in the sour cream? Do you ferment this or just eat it right away? Please address this issue- I’m sure it tastes good, but what are the health benefits? Hey I was just wondering what brand of sour cream you used? I’m still learning and am not sure what’s ok.
OMG… AMAZING, SO NICE TO BE ABLE TO HAVE YOGURT ON LOW CARB…TASTES EVEN BETTER THAN STORE BOUGHT!!! Thank you so much for this recipe! 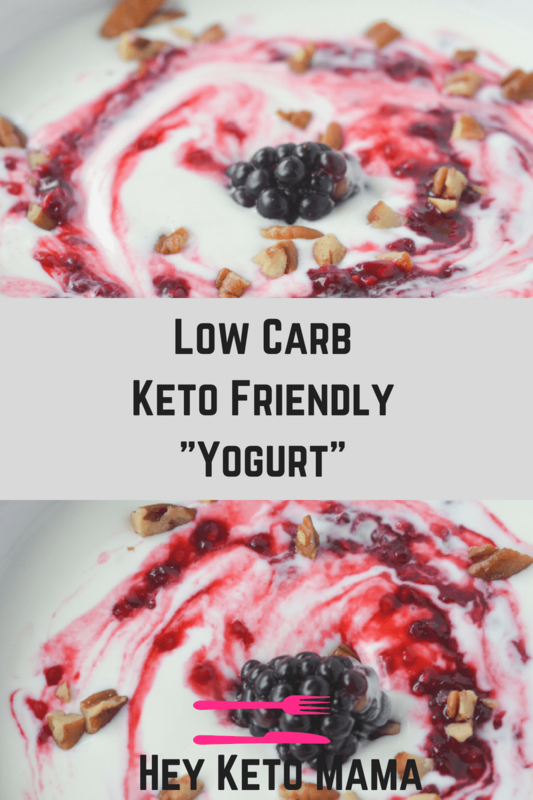 I love yogurt & started back on Keto after falling off the wagon–I discovered that it really works for me if I’m consistent), all the store-bought yogurts were so high in sugar, even the “low-carb” ones. Kroger had the only decent low-carb yogurt, but our local one has shut down (along with many others). Went online in desperation, found your recipe, had the ingredients at hand, gave it a try–wonderful! Threw some frozen blueberries in with it–even better! I won’t go back to store-bought yogurt. This fits the bill perfectly. Thanks so much!!!! This is amazing, tastes better than the store bought ones I used to buy before going on Keto. Thank You so much, was really missing my yogurt fix! Seriously FAB-U-LOUS……absolutely tastes store bought, beautifully creamy….and best of all…..gives me yoghurt whilst on Keto. Winning!!! Fantastic! Yogurt is one of a few things I’ve missed since starting Low Carb way of eating this past May. This really answers that fond memory of yogurt. Thanks so much for sharing. OMG, thank you for posting this recipe for yogurt. I was searching for a low carb yogurt and seen your recipe, tried it just now and it is delicious! I love yogurt and this is a real game changer. Thanks again! I’m a happy girl and the different ways are endless. Delicious!! Great for breakfast or dessert. With the yogurt of 8 Gms. Good for a yogurt with granola fix!! You can still have actual yogurt on a Keto diet. You just need to get the Plain Greek variety. 7G carbs put you get 17G of protein. And it is low in fat. With your homemade yogurt you may be getting lower carbs but you are not getting any protein. Remember you don’t want to be Carb Free. You are still supposed to be getting 20-50G of carbs a day. Love this! Thank you for the recipe. I enjoy this with vanilla flavoring and adding a few blackberries. Simple and tasty. I love this recipe! Is there a way to avoid the surgar crunch? I beat my heavy whipping cream to peak first and then mixed in sour cream. Next, I added powdered swerve and vanilla to taste then topped with fresh blueberries. Yum! Excellent midday treat for me and the hubby. Worth the extra carbs but we still have a few carbs we can eat for dinner later. If we didn’t, we would just have to eat a few avocados and a spinach and kale salad, then go to bed.